One of the important functions of the grinding fluid is to remove the heat generated at the many cutting edges of the the grinding surfaces and the grinding wheel. In the grinding operation where a greater material removing occurs a greater lubrication will be needed to save the grinding wheel. In these grinding operations neat oil may be applied as grinding fluid in order to achieve optimized lubrication. Quite often, the neat oil is cooled in a cooler in order to remove the heat from the grinding operation. 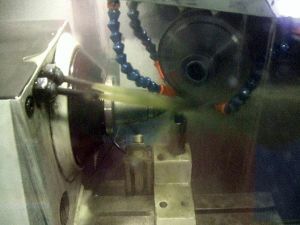 Typical examples of neat oil grinding are gear grinding and strip steel. Neat oil for gear grinding requires high filtration quality. In Vivex DinoFilter pre-coat system is made up with grinding chips in the contaminated fluid up stream of the filter cloth. Vivex grinding fluid purification is a consumable free filtration system. Purification range: Particles down to 25µ. (Option: down to 3µ). Purification capacity: Up to 10.000 liters/min/unit.